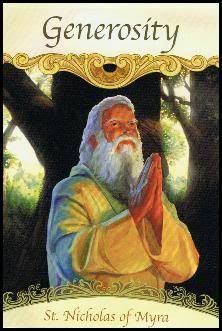 Card of the Day ~Generosity~ You’re asked to start or continue giving time, money, assistance, or goods. This act helps you know how much you have, and leads to a feeling of abundance that automatically attracts greater prosperity into your life. The more you give, the more you’ll receive. Contribute with joy and be totally detached from the outcome of your offering. St. Nicholas reminds you of the happiness that you receive when you give to others from the spirit of love. Allow yourself to be surprised at how the universe gives back to you. St. Nicholas’s legendary generosity led him to be called “Santa Claus” and become a patron saint of children and the needy. Acts of kindness and giving includes giving goods you no longer need or use to a trustworthy charity, open doors for folks in stores, offer to help somebody in need of assistance or simply offer a smile to those you come across each day. May you have a fantastic day. I love you all!